Through fascinating glimpses of art, the artists, and their critics' evaluations, you'll leave this book understanding art and artists in a whole new way. Art history at its best covering media from painting to photography, pottery to architecture, prehistoric to the late 1980s (though primarily focused on post-Renaissance). 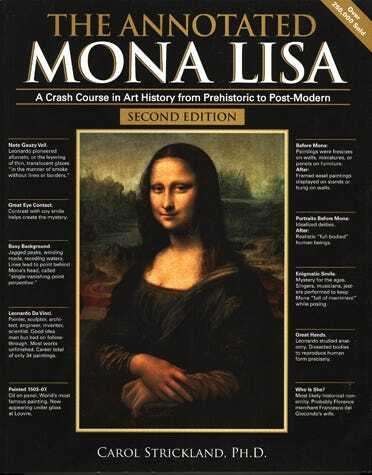 Dynamic design, page-length essays, sidebars, and hundreds of vivid illustrations incorporated into the text, make The Annotated Mona Lisa a browser's delight, as well as an authoritative reference that can be read with pleasure from cover to cover. Includes fascinating glimpses of art, the artists, and critics' evaluations. You'll leave this book understanding art and artists in a way you probably never have before. Highly recommended for serious art students and the artistically inclined from approximately seventh grade up. Oversize Pb, color & b/w illus.